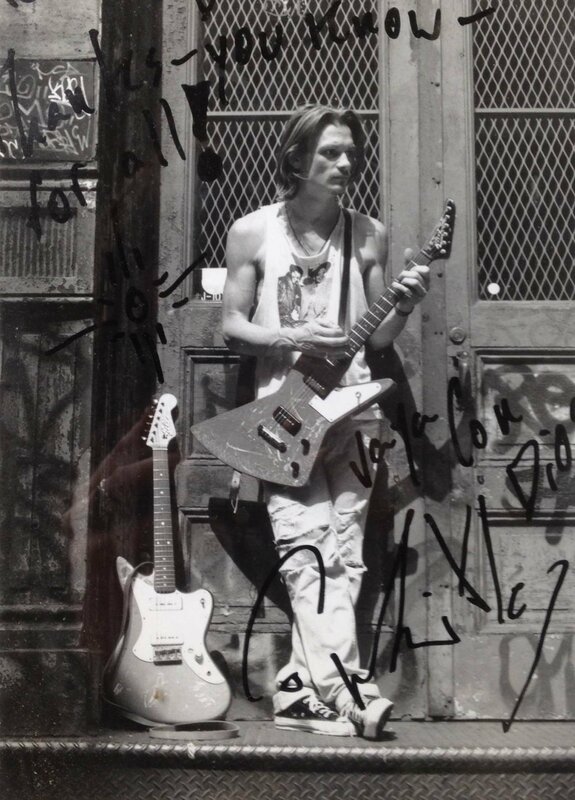 Hiroshi Suda has compiled an inventory of the many guitars Chris played. If you can offer corrections or additional info, please use the “Comment” feature at the end of this post, and we’ll add your 2-cents to the descriptions. 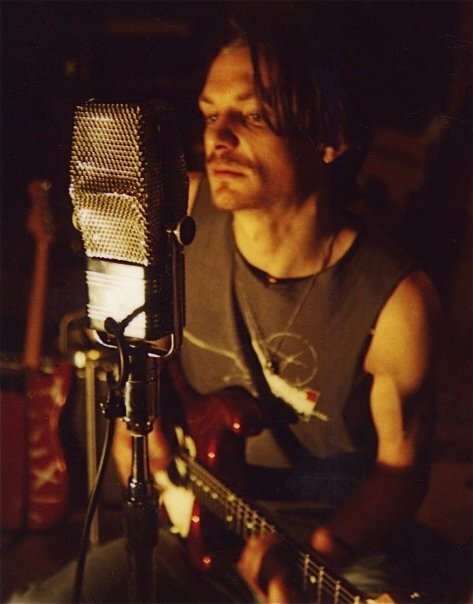 [Note: Larger photos can be viewed on All Things Chris Whitley Facebook page.] Thanks to Jeffrey Duke Patterson, Dan Whitley, Hiroshi Suda, and other members from the ATCW group for helping to identify the guitars in the photo below. The Danelectro is an inexpensive guitar originally sold as a Silvertone by [gasp!] Sears & Roebuck. Lest you hold that fact against it, you should know that both the Danelectro and the Silverstone have been played by such esteemed guitarists as Jeff Beck, Jimi Hendrix, and Jimmy Page (Danelectro especially notable on “Kashmir”) [review of ’59 Original]. 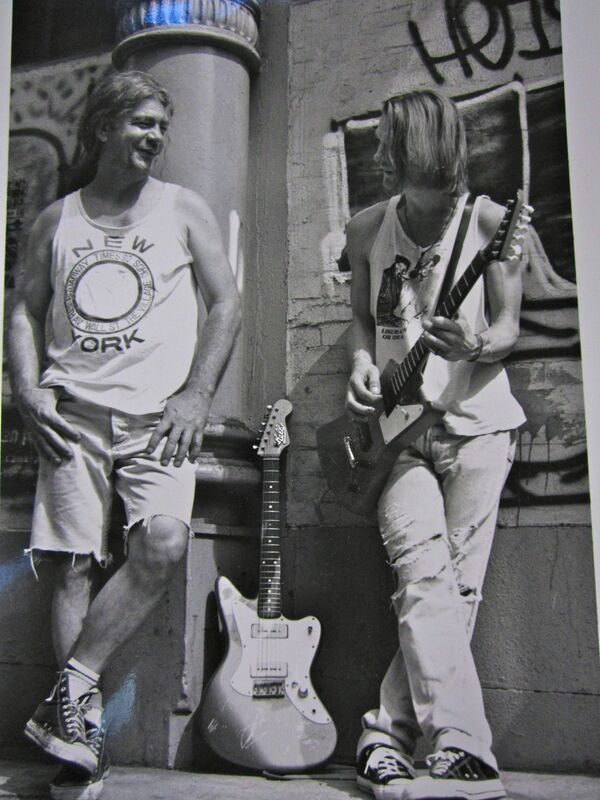 No wonder Chris was sanguine about allowing daughter Trixie to scrawl all over his Danelectro! 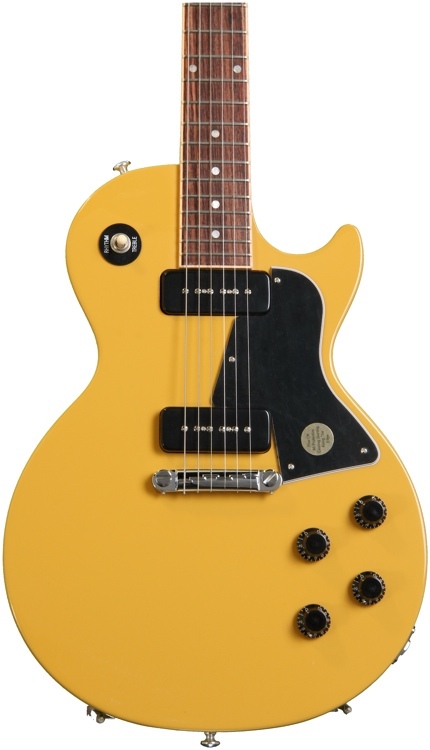 The Gibson Les Paul “family” begins in 1952 with the goldtop Les Paul Model. But then, in 1954, two additional models were introduced: the fancier Custom with the carved top of the original; and its plainer, less expensive cousin, the Junior. As noted in a Vintage Guitar article, the Junior “was stripped not only of its ornamentation but the carved maple top cap, as well. It had a ‘slab’ mahogany body, unbound fingerboard, dot inlays, and a decal peghead logo. To make it even more affordable, it had only a single dog-eared P-90 pickup rather than the two soapbar-covered single-coils of the original and the Custom.” The Special, introduced in 1955, was a step up from the Junior, providing a bound fingerboard and pearl logo and two pickups. Adding to the confusion (at least among guitar-know-nothings such as myself), “[I]n late ’59, for no apparent reason, the Les Paul Special became the SG [“solid guitar”] Special. For all practical purposes it was the same guitar, with the same double-cutaway body and the same features except for the lack of the “Les Paul” silkscreen on the peghead and a slightly different pickguard” [Vintage Guitar]. 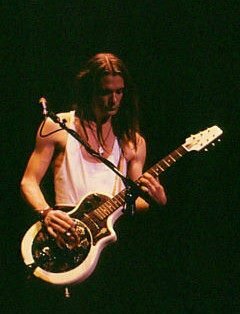 As the All Things Chris Whitley group discussed Chris’ gear, what appear to me to be the same three guitars were variously labeled a “Gibson Les Paul Junior,” “Les Paul TV Special,” “Les Paul Special,” “Les Paul SG,” “Gibson SG,” etc. For more info about and photos of the SG, see here. 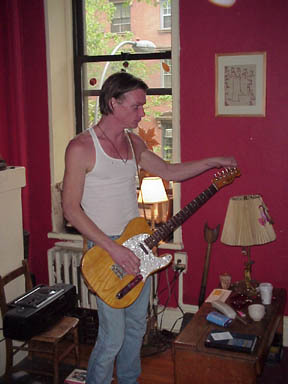 The guitar Chris called “TV” on set lists is show in the first photo in the table below. 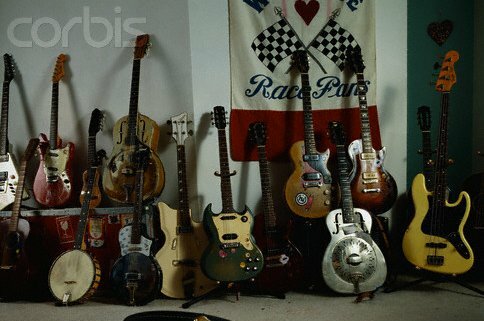 The second, which Chris called “JR” (Junior), is shown in the middle photo, and the third, which I believe is the Gibson SG, is show on the right. Either the TV, Junior, or SG were played on a few LWTL (Bordertown, Dust Radio) and many Din [ Ultraglide, , Narcotic Prayer, WPL, Some Candy Talkin’, Can’t Get Off, Din, and Liberation or Death) and Terra (Clear Blue Sky, On Cue, Aerial) tracks. 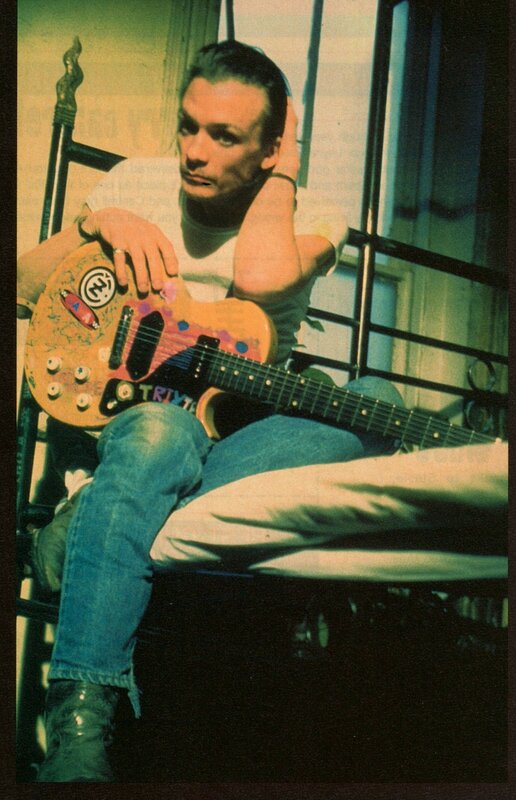 Enjoy the gallery below of various photos showing Chris playing these guitars – and let me know if I’ve misidentified any! 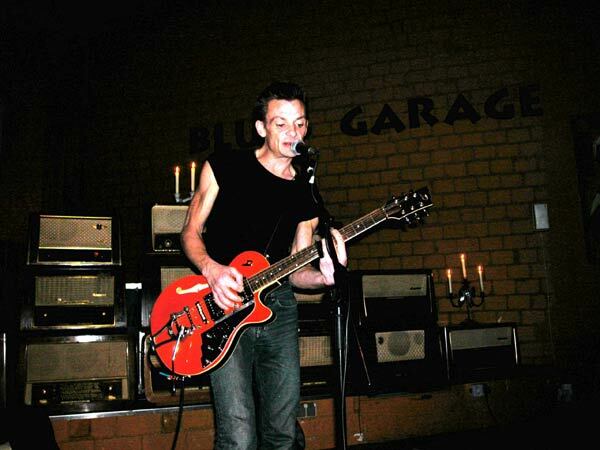 Technically, the Gibson Melody Maker might be included in the Gibson Les Paul guitars discussed above since it is sometimes compared to the Les Paul Junior and Gibson SG. Chris’ guitar, the double-cutaway model introduced in 1961, is probably a late-60s since it features “the pointed ‘horns’, a large white scratch-plate, and white pickup covers instead of black” as introduced in 1966, making it similar to the Gibson SG [Wikipedia]. 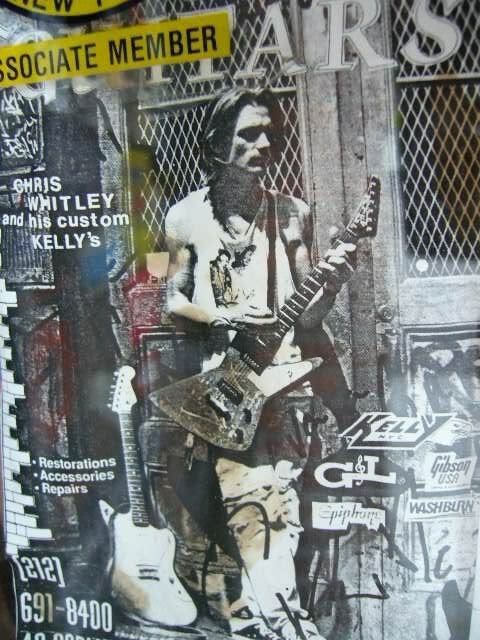 Chris also played this guitar on “Narcotic Prayer” at Khyber Pass. Here, the color is not readily discernible, but if you love that song, you’ll agree that this fact alone makes this guitar PRICELESS! 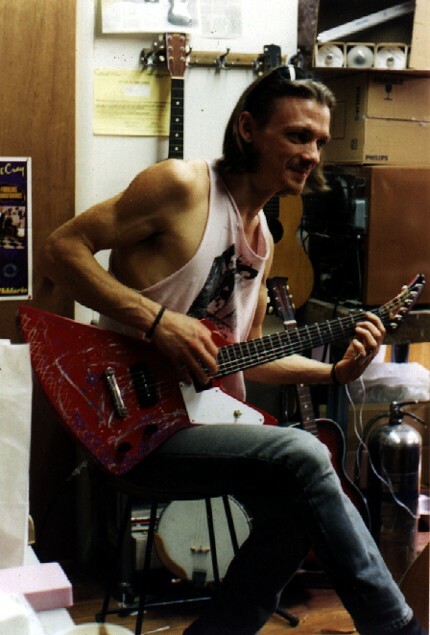 In 2003, Duesenberg guitars designed a custom guitar for Chris, whom they called “one of the greatest singer/songwriters.” The Chris Whitley Signature model includes “a special transparent red finish, a fretboard with custom Mother-of-Pearl block inlays and a Piezo pickup in the bridge” [Wikipedia]. You can see more photos of Chris with his custom Starplayer on the Duesenberg site. For those wanting more “drool over” photos, check out the slide show of close-ups here. And to hear and to see the guitar in action, find this YouTube video – almost 9 minutes putting the guitar through its paces. Chris owned a National Resolectric R-1. Many thanks to Anders Halvorsen for the following info about Chris’ National Resophonic guitars. The vintage National “Resophonic 1133” was a pure, acoustic instrument. 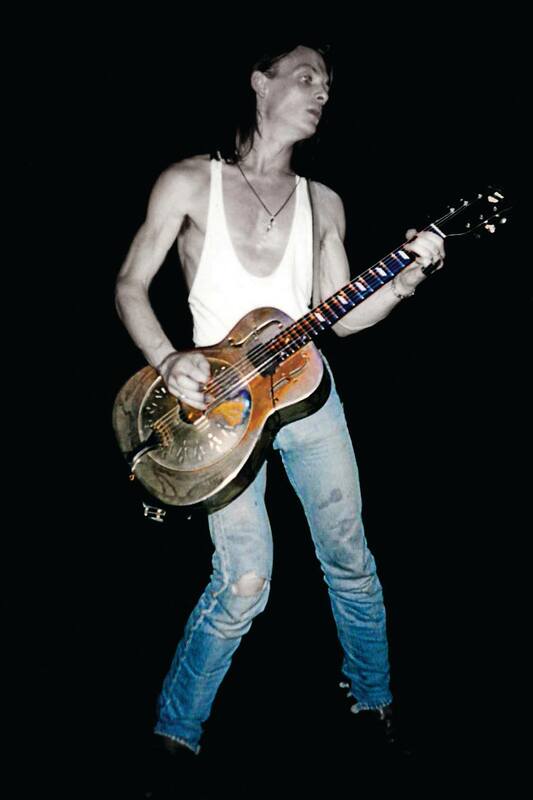 The pickups in Chris’ Resophonic guitars were added later and are not original. The National Reso-phonic Student model, as it is called, came with two different model numbers, 1133 and 1033. The difference was the neck: 1133 was a roundneck (CWs guitars) while the 1033 was a squareneck for lapstyle playing. CW owned (at least) two or three of these Reso-phonic guitar: The red one that’s pictured with a very young CW and two black ones with different coverplates. These could be the same, as one of the coverplates is none-original and could have been a replacement. After much confusion and more help from people who know these things, I now understand that Chris played TWO Style Os: a vintage National String Instruments from c. 1939/40 and a new National Resophonic from c. 2002. “New” Style O; note e.g., dot fret markers, slotted headstock, and pattern of cone cover. More information about vintage Style Os can be found here; learn more about contemporary Style Os on the National website. 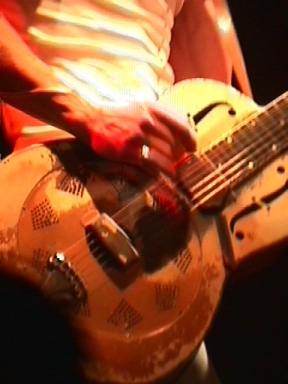 Chris’ most recognizable guitar, the National Triolian was featured extensively on promotional materials for Living with the Law. This icon, which he named “Mustard,” is so special that it merits a separate blog post with more pictures and a full discussion of this gem! Find it here. A less well-known guitar, played extensively on the Perfect Day CD, is the Martin acoustic. Chris’ model is a1956 (Chris id-ed on the KMTT 1999-04-14 radio show) 00-15 or 000-15. Based on photos at the Martin website, I’m thinking it might be the 00-15M, but I’m at a loss to explain the two large white dots on the pick guard. 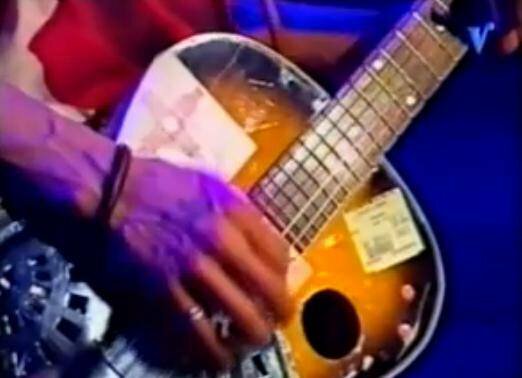 Hiroshi further hypothesizes that Chris didn’t bring this guitar with him on tour, but that he played it at some radio shows – i.e. 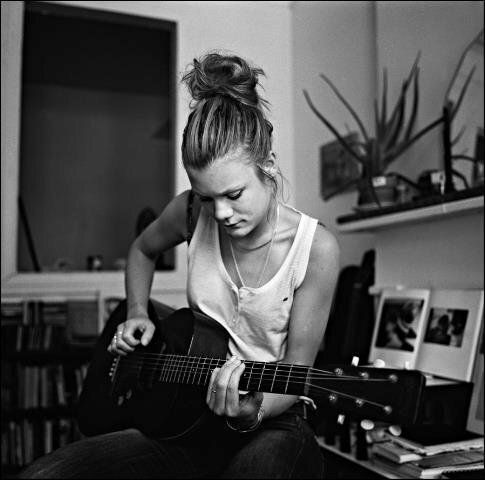 KMTT, KBAC – in 1999, especially on acoustic versions of Firefighter (Little Torch later). You can listen to the full KMTT show here. Among the tracks recorded using the Martin are Perfect Day, Crystal Ship, and Solid Iron Heart. Trixie now owns this guitar and plays it on a lot of her songs, e.g., . 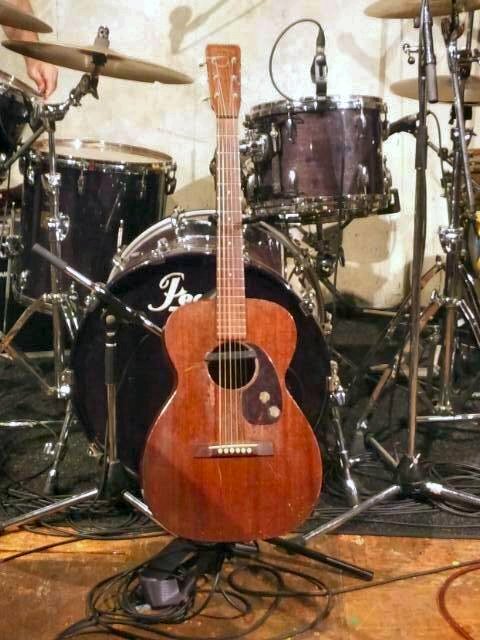 According to Hiroshi, Trixie did not “inherit” the Martin from her father; rather, she bought it back from someone who had bought it from Chris. The two photos below show father playing the Martin during the recording of the Perfect Day CD of covers and daughter playing the same guitar, several years later. 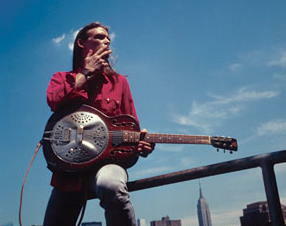 Chris seems to have owned several Dobro guitars: at least two metal-body and two wood-body Dobros. 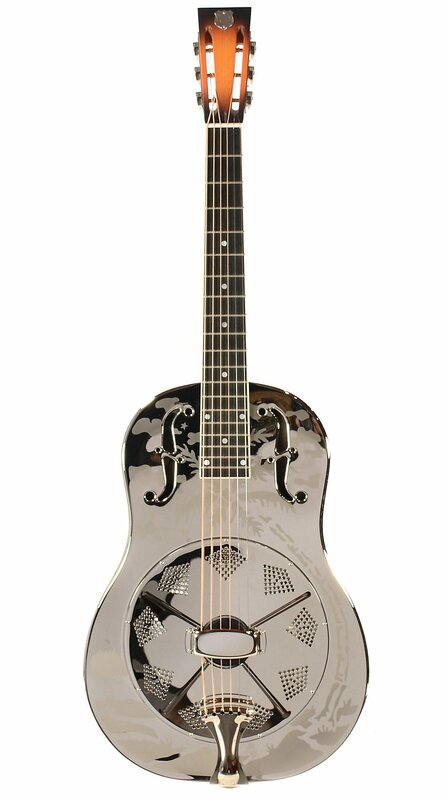 The Regal/Dobro metal body differs from National resonator guitars of the same vintage (1930s) in that Regal/Dobro tops and backs were fastened to the sides with a unique rolled method that required no soldering. This “lip” lead to the guitar sometimes being referred to as a “Fiddle Edge”. Guitarhq.com notes that the M-65 had a “nickel-plate brass metal body (like a National Style O), ‘singing ladies’ scene sandblasted into the nickel finish, dot fingerboard inlays, bound rosewood fingerboard, round window sound holes, [and] DOBRO inlaid with celluloid into the rosewood peg head veneer.” This model first “appeared in catalogs in 1938 (but may have been available a year earlier), and hence should always have a pick guard (or at least two holes in the body where a pick guard was mounted), and was discontinued in 1940. 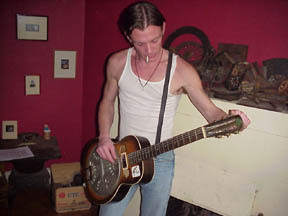 Another metal-body Dobro has been identified as the M-35 (possibly 1938/39 to 1941). 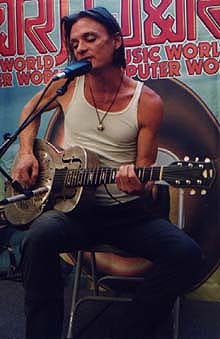 Guitarhq.com describes this model as having a “sheet metal steel body, walnut sunburst (yellow or orange fades to brown) painted finish, usually segmented “f” holes (but sometimes round window sound holes), dot fingerboard inlays, bound rosewood fingerboard (sometimes unbound), 14 frets clear of the body, painted resonator plate, [and] gold sparkle peg head overlay with “Dobro” peghead decal.” This model also appeared in the late ’30s and was discontinued in 1940. 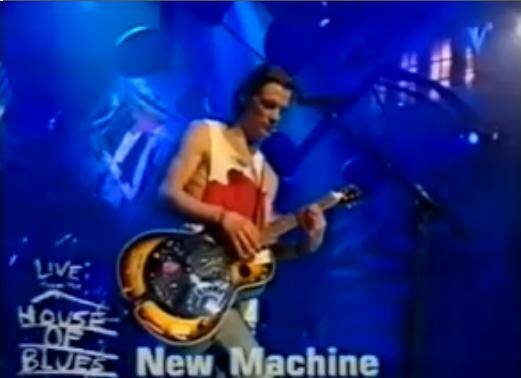 Possibly listed as “Brown” on set lists, Chris played the M-35 on e.g., New Machine [see video here], God Thing and Never. The earliest Model 27 had an unbound stained with perhaps faux wood grain body, the hardware was painted silver and some instruments had painted frets …. The Model 27 was constructed of non-descript hardwood laminate (generally birch or ash). The top of the guitar was finished in Dobros® traditional brown sunburst, with the dark area extending around the outer periphery of the top. The back, sides and neck were finished in a very dark brown, which almost appeared black. The top only was bound in white celluloid, and the fretboards were unbound and most often of rosewood …. Late in production (sometime after 1937), Regal-built Model 27’s were bound both on the top and the back and even the fretboard was bound. Otherwise, their features match those of earlier Model 27s. According to gbase.com, the1958 Gibson ES125 has “a maple top with a vintage sunburst finish. The mahogany sides and maple back are stained a dark brown. Both the top and back are bound. The top has dual f holes and a raised celluloid tortoise pickguard. It has a mahogany neck with a rosewood fretboard that has seven dot inlays. A Gibson gold script logo can be found on the headstock. There are 20 frets of which 14 are clear of the body. …. Other features include a single P90 pickup, gold bonnet knob volume and tone controls, a compensated rosewood bridge. a nickel trapeze tailpiece, and three on a plate deluxe Kluson tuners with plastic white buttons. 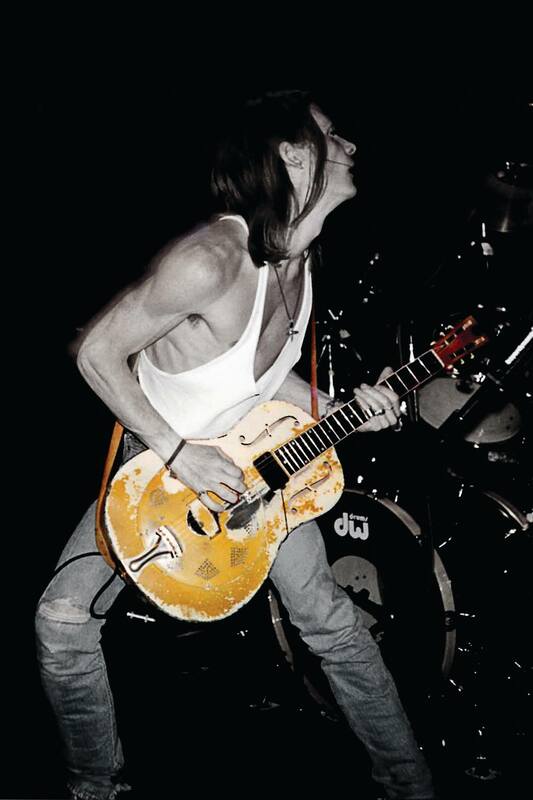 Jeffrey Duke Patterson notes that “Chris had this guitar a while and used it quite a bit. 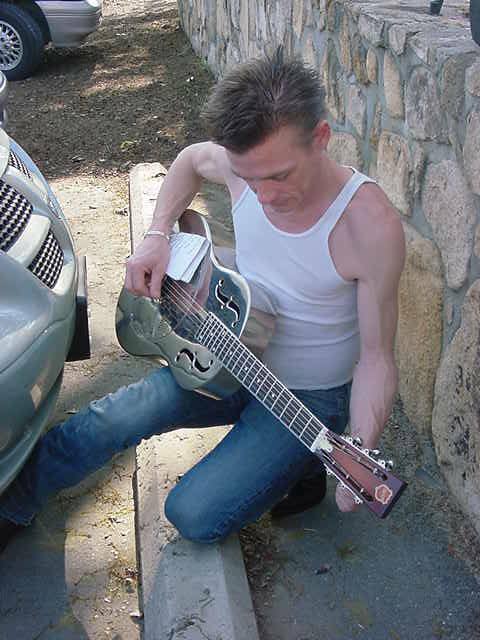 He loved that it was an archtop f-hole hollow-body, with a really hot, factory P-90 pickup in the neck position. He could really get some good dirt and grind, tone-wise, out of this guitar.” The Gibson ES was played a lot on Terra Incognita (e.g., As Flat As the Earth, Power Down, Weightless, Cool Wooden Crosses, and Automatic). 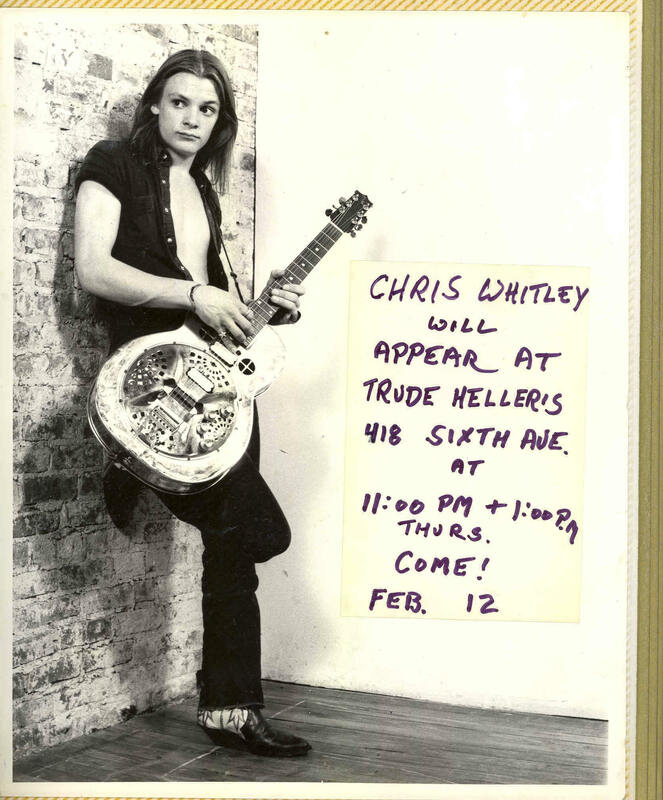 Also known as “The Whyte Laydie,” Chris played on e.g., Ballpeen Hammer, The Model. Thanks so much for this website. I was wondering if anyone knows where Chris got his slide, I’ve been looking for years and no one seems to make them. It’s the one that is full length but is only a slide on one side and open on the other so you can flip it around and use your finger when you don’t want to play slide without taking it off. Thanks again. Wow, that was my question exactly. I noticed that slide he used, as well, and have never seen the like anywhere else. Of course, it is not out of the question that it is custom made. I would love to know more about his choices in effects and amplification, as well, beyond the pickups he put on his Resos. He has tracks with a lot of really effectively controlled feedback, for instance. How did he get those sounds? “Clear Blue Sky” comes to mind, but there are other more than a few other examples, as well. 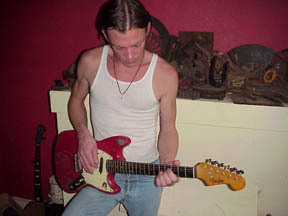 What effects Chris used is frequently a subject in the All Things Chris Whitley group on Facebook. 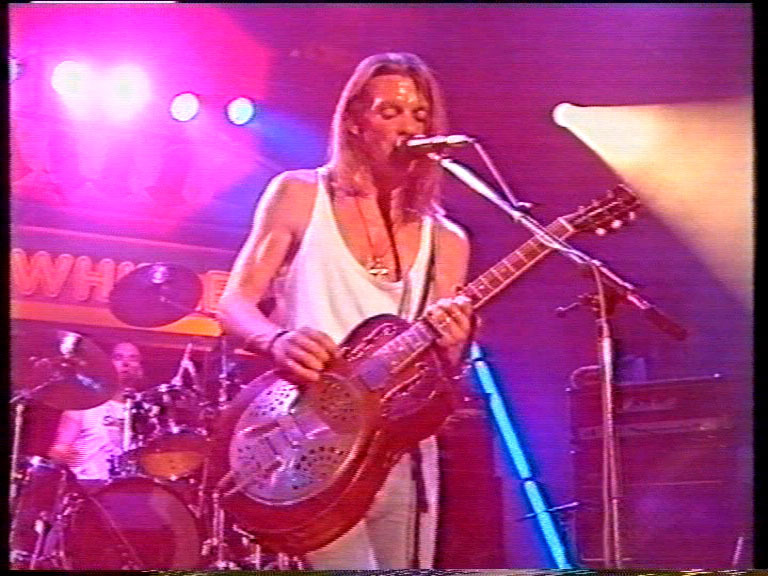 Guitarists were especially curious about Chris’ “wah” pedal when he played an early, totally rockin’ version of ALTITUDE at the John Campbell tribute in August 1993 (see the Brides of Jesus video at the end of this post: https://allthingschriswhitley.com/2016/06/19/dirt-floor-media/).